Sometimes storytime is just plain silly. After seeing my own kids and their friends walk around with fake mustaches on multiple occasions, I had to buy some to go along with some new mustache and hair related books I found. I’ll admit that it was a bit of a mental challenge to turn stick-on mustaches into an early literacy program, but it can be done (as others have proven). The great part of using mustaches in storytime is the opportunity it allowed to generate conversation in a light hearted way- mustaches are silly things! They also provided an avenue for talking about differences and similarities and, well, the chance to read stories allowed while wearing a fake mustache! I’m not too proud to show up wearing a mustache, or some other accessory, if it makes for a better storytime experience. In planning, I considered interactivity, movement, ECRR early literacy skills (and practices), engagement, the art extension possibilities and the fun factor. Since it was still March, I also wanted to bring the letter ‘M’ back into the spotlight. Here’s what I did. We started with the Song Cube, always a hit. I then introduced the storytime theme with Keynote slides on my iPad featuring the variety of mustaches judged at the International Beard and Mustache Championships. I can honestly say every kid, and even a few adults, in the room had no idea there was such an event. Each slide I created had an image of someone with a mustache and the name of the mustache style underneath. As I pointed to each name, we talked about it, especially how the mustache got its name. If the person in the photo sporting the mustache was famous, we talked about why. Using a Keynote slideshow, even with the just the iPad screen, catches the kids attention and allows me to provide additional information that compliments the storytime content. Then I passed out the mustaches. We took a couple of minutes to sort out which shape and size the kids wanted to wear and what it was called based on our new found mustache knowledge. I bought them in two different places- Old Navy (by the checkout) and at Oriental Trading. The mustaches I got from Old Navy were on sale and better quality, but they didn’t have the number I needed. Here is where the giggles come in. All of the mustaches went on faces, at least initially. Then as I read the first story, they started to get peeled off and stuck on other random body parts. One even ended up on a little boy’s chest, followed by “Look, mine is chest hair just like my dad’s!” Too funny! 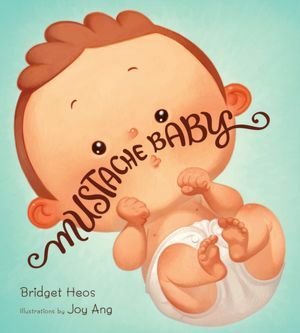 A baby is born with a mustache… wait, what? The kids thought this was a bit strange, but loved the pages that showed baby’s transition as the mustache turns from a good guy mustache to a bad guy mustache and then back to a good guy mustache. Sweet story. Mo is defining his identity. He thinks a nice black mustache will do the trick, but finds that every attempt he makes to differentiate himself from his friends leads to copying. Eventually his friends remind him that copying is the best form of flattery and that he is awesome. A final fashion show reveals everyone’s individuality, even Mo’s. 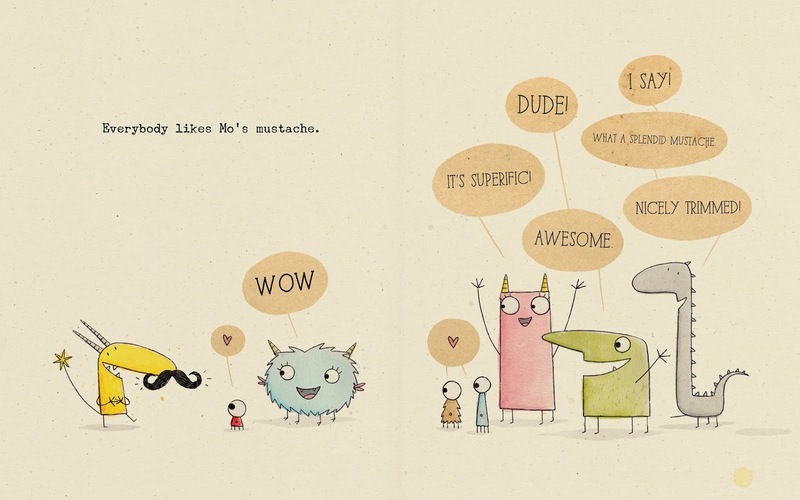 This book offers opportunities to talk about the different mustache styles we learned about in the Keynote. 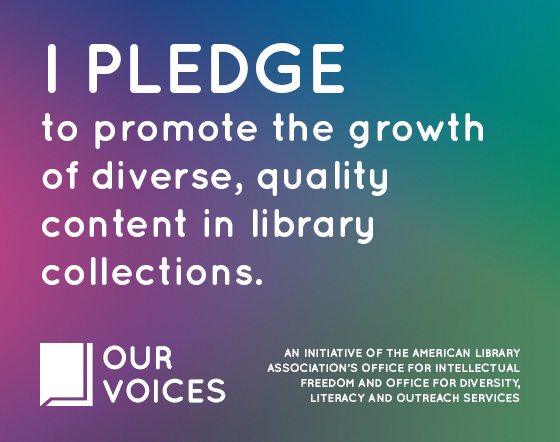 I am always on the lookout for high quality apps to will add value to storytime. I am a huge fan of the open-ended Toca Boca toy apps with their cross-cultural appeal, game-less design (no coins, points, etc. ), and imagination-inspiring nature. I thought this app might fit well with one of the smallish groups I have. It didn’t quite work how I thought it would though. I took a photo of myself before storytime and I intended to have the kids decorate and manipulate my selfie, but things got a little crazy and I was managing kids rather than exploring the content with the group. This app may work better with a large screen and the kids sitting in a circle, touching the app one at a time. 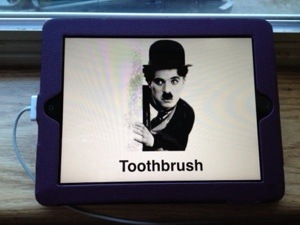 It is a nice app in a one on one setting, which I mentioned to parents. We gently moved on to another song and book when I saw what was happening, not unlike what I do if a parachute, book, or song is not a good fit. The good part about sharing this app was showing families how it worked and describing why I think it is a quality app- both useful for families searching for and evaluating apps to explore with their kids. While storytime was focused on facial hair, I just had to include the hair that grows on top of our heads. 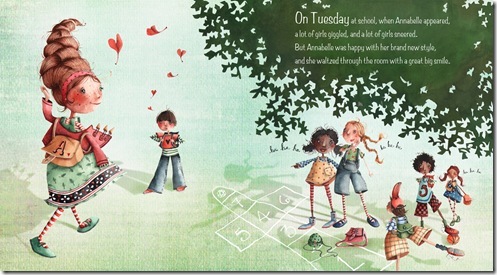 This is the story of Annabelle who is frustrated by the sameness that proliferates at school. She decides that styling her hair like her grandmother’s bouffant is the way to go. 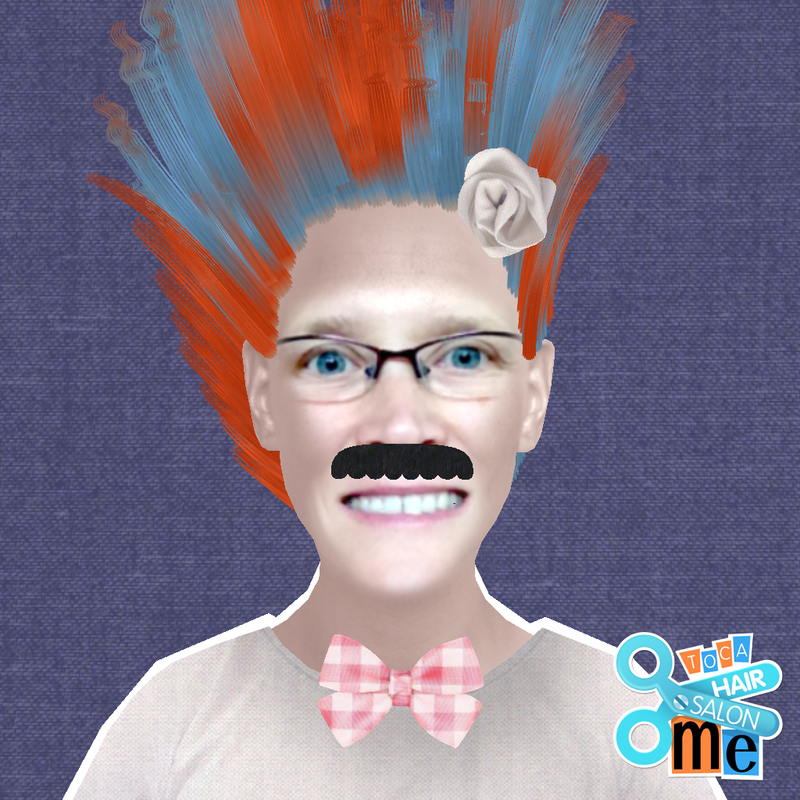 At first her mother resists and Annabelle must use her creativity to style her hair on her own. Eventually mom pitches in and creates the impressive hairdo. other kids are so impressed that they follow suit. The book is rich in creativity and even offers opportunities to introduce measuring and comparing, both great math skills. For the art portion of the storytime, I made three stations. I found this project idea at Mom to 2 Posh Lil Divas. While we didn’t make mice, the watercolor painting was a hit. This was a new experience for many kids and they loved the chance to just paint. I taped the letter ‘M’ on pieces of cardstock before storytime and then had everything set up for the budding painters. The idea was to paint all around the tape so that when you pull of the tape, you’ll see the unpainted letter amongst the beautiful watercolors. Sorry, but I didn’t get a photo of the finished product! I printed out a coloring sheet from the internet and made bowls of glue, paint brushes, and macaroni noodles available for station #2. These kids love glue, but don’t often get to paint it on. The younger kids especially loved this. I discovered a brand new feltboard and chalkboard in the bowels of our library recently! I decided it was time bring out the board and the big tubs of colored chalk we have in the cupboards. 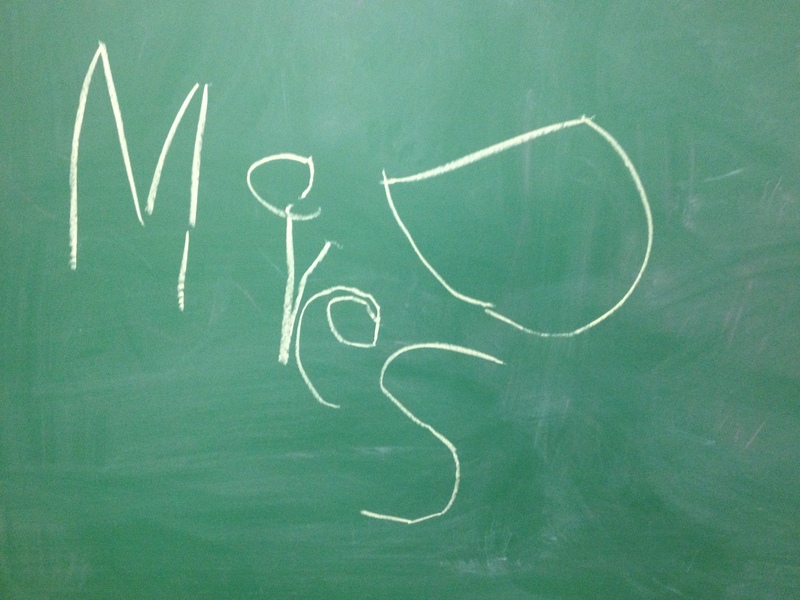 Kids wrote their names, colored, drew pictures, and told stories together.